On a sunny bright spring day, Germany's border city Furth welcomed the “Journey of Fa-Rectification Photo Exhibition” in Wald's City Hall. The Mayor and Director of Culture, Mr. Ochsenmeier, took time out of his busy schedule to attend the exhibition's opening ceremony. Mr. Roemer from Germany's International Human Rights Organisation, (Internationalen Gesellschaft für Menschenrechte) also showed up to support Falun Gong practitioners' protest against the persecution by the Chinese Communist Party. Two reporters from the local newspaper conducted an interview. The opening ceremony reflected the peace and righteousness of the exhibition. The Mayor's speech praised China's traditional culture, respected the moral values of "truthfulness, compassion, forbearance" advocated by Falun Gong, and condemned the persecution of Falun Gong by the Chinese Communist Party (CCP). He also hoped that the photo exhibition would bring the truth to more people. Mr. Roemer of IGFM revealed again during his speech the orders issued by former CCP leader Jiang Zemin to persecute Falun Gong practitioners: "Discredit their reputation, destroy them financially and eliminate their bodies." At the same time he said that he admired Falun Gong practitioners for risking their life in such an evil environment to screen programmes on national TV stations controlled by the CCP, letting the Chinese know about the valuable truth. After the speeches, Falun Gong practitioners candidly exchanged views with the Mayor and reporters. A reporter even suggested the recently elected Mayor learn the five sets of Falun Gong exercises in order to relieve pressure from work. The city government was beset with financial difficulties at that time. Even so, the Mayor still extended a helping hand to Falun Gong practitioners and offered the city hall for the photo exhibition without charge to help stop the persecution by the CCP. Practitioners expressed gratitude for this. 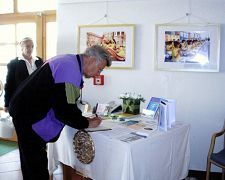 Falun Gong practitioners showed the mayor around the photo exhibition. After the Mayor saw photos of the Chinese traditional dances and paper lotus flowers made by practitioners, he mentioned right away that the paper lotus practitioners gave him has been on his office desk ever since. A Falun Gong practitioner said with a smile that the lotus will bring good fortune to him.